How does the world's leading conversation rate optimization expert use email marketing to drive lead to customer conversions? 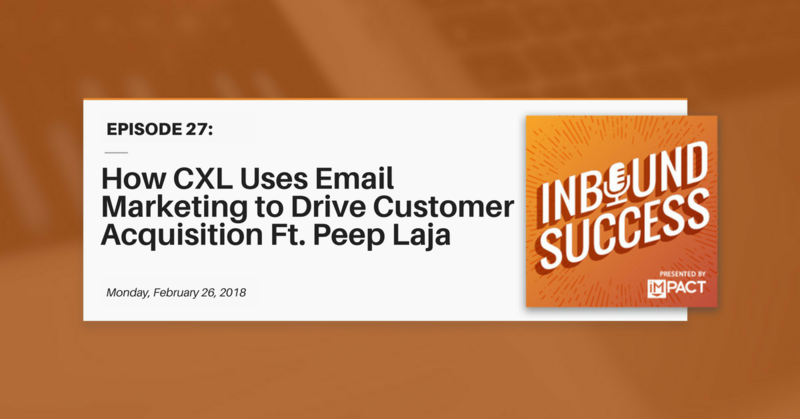 In this week's episode of The Inbound Success Podcast, CXL Founder Peep Laja (voted as #1 most influential conversion rate optimization expert in the world) shares the specific email strategies and tactics that he and his team have used to acquire 80% of the company's new customers directly from their email campaigns. Kathleen Booth (host): Welcome back to The Inbound Success Podcast. This is Kathleen Booth. I'm your host, and today my guest is Peep Laja of ConversionXL. Peep, welcome to the podcast. Peep Laja (guest): Thank you, thank you for having me, it's a pleasure to be here. Kathleen: Well I'm excited to talk with you. Before we dive into some of the marketing topics we're going to discuss, tell the audience a little bit about yourself, who you are, your background, and also about ConversionXL, please. Peep: I have a diverse background. I worked in sales, I was a professional fundraiser for non profits, I was a software developer, a direct response marketer, affiliate marketer and all that led up to a mix of experiences that served well when I started my career as a conversion optimization person. So I started CXL, formerly known as ConversionXL, in 2011 and I started a conversion optimization agency. I did that for ... Well, the agency is still there. So I grew the agency and then two years ago started CXL Institute, which is offering data driven marketing courses. So yeah, so I'm predominantly focused on conversion rate optimization, but have done a bunch of things. Kathleen: How did you get interested in conversion optimization, because you do have such a varied background. I'm curious why that was the thing you chose to dive deep on. Peep: It was two things. So first I had an SEO company, or I was a freelance SEO person and this was in like 2007. It wasn't very hard to get my clients ranked page one in google, and I managed that, and they got a bunch more traffic, they weren't still making more money or just a little bit more money, not a lot more money. And then I realized making money online is not just about traffic, there's another component to it. And then I discovered the first people writing about it, you know, it was the Eisenberg brothers, this company out in Malaysia called Mindvalley had a course on it and I like started digging in. And then years went by, did a bunch of different things and then I had a start up that failed and after it failed I was "Well, now what?" My start up failed because I did not have any money, any audience, no name recognition, nothing. So I told myself, next time around, I'll build an audience first, so I knew I wanted to start a blog. And so what do I want to start a blog about? So basically I did keyword and competition research, figured out that conversion optimization was ... There wasn't much competition, very few blogs around and that was it. Kathleen: I love it. So you started the company, and the company has evolved quite a bit in terms of its business model. When you and I first started talking, you know, we were discussing some of the things you've done from a marketing standpoint that have really fueled the company's success over the years, and it was interesting to me that one of the big things that lept out was email. Tell me a little bit more about that. Peep: So I started the blog 2011 and of course you need to have good content in order for the blog to get anywhere, so I focused on good content, and I focused on driving traffic to the blog, but like what do you do with the traffic? At first, I wasn't selling anything, so I was just capturing emails, so that was all that I was optimizing for, capturing more emails. And over the years, the list grew and grew and is still growing and now sending emails to people who want to hear from us including promotional messages is working really well. So I would say about 80 percent of our money is coming from the list. Kathleen: That's amazing. To what do you attribute your success with email? I mean, obviously having a big list is step one, but that certainly doesn't guarantee that anybody's going to open it, read it, click on it, convert on it. What's went well for you? Peep: I guess it starts with the basics. You need to send people emails that they would enjoy reading and opening. For the first four years or so, five years, we did not sell anything to our email list. We were just sending our weekly newsletter, which really consists up to this day of our blog posts, so it's kind of like in a way how people are subscribing to our blog, so we publish great content on the blog, which has made us known in our space and so email is a way to get those notifications about the blog posts. So that was what we were doing for the first four or five years and we weren't sending any promotional messages, because we were running just an agency and now we're conversion optimization agents with fees that start from like $10,000 a month for retainers. So most people in the list would not be able to afford it. So we were fully aware that it's a complicated product, a long consideration cycle, so our strategy all along was: join our email list, we will prove to you that we know what we're talking about by sending you content, demonstrating our expertise and then eventually, when you have the need and the budget, we will be top of your mind, and you'll look us up. And that worked really well. Two years ago we launched CXL Institute, so we wanted to add a more scalable aspect to the business, and most people in our email list essentially weren't making us any money because they were not hiring our agency, so it was also another way to monetize the people on our list. And then we started sending for the first time promotional emails, sales emails. Essentially "Buy this course." And it worked, we started to make money from these emails. The way we did it was also basically everything we emailed was kind of a launch. So we sent people an email that says "Hey, we're about to do a course on xyz, are you interested?" And we just had them reply "Yes, I'm interested." And then we gathered maybe, I don't know, however many people replied to that. Maybe like 3,000 people said "Yes, I'm interested." And only then did we start to send them more emails basically building up the hype about those courses. That it's now, it's coming, it's coming and then it will contain this and that. Until the day the course launched, we sent them an email with maybe a discount coupon and they bought it. So we instantly started making a lot of money selling courses. And then of course if something is working, your immediate thought is "let's do more of that." So we started to build more courses and sent more emails. And over time, the effectiveness of these sales emails started to come down. Because we weren't sending any sales emails and now we were sending a lot, so people were getting kind of tired and the most motivated people had already bought one or two courses from us and so budget maybe started to become an issues and there is also a limit of how many courses one person can consume. And then we realized that we need to do two things. One, we needed to grow our email list even faster so as to bring new emails in from people who haven't received the previous sales messages and now they can get them. So that's one - we need to focus on growing the email list. And two, we need to start sending more relevant sales messages, because our first approach was we're sending the same message to pretty much everybody - you know, everybody on our list. Our list is around 100,000 people and the open rates and click through rates were in constant decline, because we were just bombarding them with sales messages essentially. Peep: Exactly, we sent an email on "there is this course coming up" and then we kind of segmented, we only started to send follow up messages to people who had confirmed "Yes, I'm interested." So we were sending those emails to everybody, and we started to realize that this is a road to nowhere, and tactic fatigue is going to kick in. The people will be tired of receiving emails from us, and we're gonna die. Peep: Exactly. Email was bringing us money, and if suddenly nobody is going to open our emails, we're going to be not receiving any more money, so it was a problematic situation to be in. So what we figured out was that we need a better way to send emails. So you know, we all know we have to be data driven and all that and you know, mass blasting is so 2009, but still everybody's doing it. And mainly because your data is siloed. So you know, you have your web analytics in one tool, maybe you use GA (Google Analytics) or whatever and then you have your email marketing software, whatever you want to use, and then you have your CRM and then you have your whatever components of your tech stack. And often these systems don't talk to each other. So we realized that we have to know who these people are in our email list and what are they interested in. Two, we need to make sure all our data is merged so there is no piece of data that's siloed, so our email marketing tool has to be able to hold data from our sales history so we can email people who have bought product A, but not product B and things like this and then it's like "how do we do this, how do we finally make this data driven email marketing happen?" And sure enough, the answer is now out there and accessible to everybody. So you have to use something called CDP, it's customer data platforms. It's essentially a piece of software that sits in the middle of all your other pieces of martech, so your CRM, your WordPress website, your Stripe, whatever you have there. It can talk to anyone through an API. We picked a tool called Hull, www.hull.io. It's one of the many great CDP options out there. CDP's are of course a growing market, they are mostly for large enterprises in terms of their pricing. So if you're a small business it might be difficult still, but I think like with anything in life, like everything that used to be available for only enterprises is becoming quickly available for everybody. So anyway, so we got Hull. How we implemented our data driven marketing process was as follows. We used Intercom as our email marketing tool and Intercom also serves as our CRM. Our website is built on WordPress, so our WordPress is sending data on purchases to Intercom, because Intercom also basically has the email list, names and emails. So we are attaching their purchasing history to the database in Intercom and then we added the CDP Hull and we're pulling all data from Intercom to Hull and then we are adding Clearbit, which is an email in data enrichment tool that will add up to 50 data points about every email you have. Well not every email, it has to be your business email, so if it's a Gmail or a Yahoo, it's likely it won't find anything. Kathleen: Yeah, we've played around with data enrichment and same challenge. We get a lot of these personal emails and you can't do much with those. Peep: So for some things Clearbit will know something, hence it's also important that in your email capture you ask people for their work email, not their personal email, although that is also a problem, because people change jobs, what, every two years. Peep: So, you know, your email list will become obsolete in two years once they change jobs, so in that sense you want the Gmail, because that's permanent. Kathleen: Yeah, somebody's gotta invent a data enrichment solution for Gmail. Peep: Exactly. And then another problem is that if you wanna build custom audiences, you know for Facebook advertising or Linkedin advertising, nobody has their Facebook login or Linkedin login as their work email. It's always their Gmail or Yahoo or Hotmail. So if you put a bunch of work emails and you want to build custom audiences on Facebook, it doesn't find anything, because there's nothing attached to that email. So it's still an ongoing challenge, like should you get Gmails or work emails? But if you get work emails, you can enrich them. So we're using Clearbit for it and it's amazing and it's cheap, so there's no reason that every single person shouldn't do that. Every small business as well, as it's really affordable. I think for 50 bucks a month, you can enrich up to 5000 emails a month. Kathleen: Yeah that's really reasonable. Peep: So basically you should set it up any time you capture an email, so it's enriched right away. Now what happens is you get data about what kind of a company it is. Is it e-commerce, B2B, B2C, etcetera? You get information about their revenue. It's an estimation of course, but still it works. It's like these guys do above ten million a year, or under a million a year. You get job titles. You can target people whether it's a marketing manager or an SEO person or someone in HR. So if we have a course on product management coming out, we're going to email it to product people. And we're targeting people based on their title so all the SEO and conversion people are not getting any emails about it and the product people who are receiving the promotion about the product management course, they're likely to be actually interested in it. And this is assuming that your product that you're pitching is actually good, which in our case always is, you know, if I may say so. Peep: Yeah, so if you're sending content, emailing content to people, your content needs to be good. If you're selling courses, it needs to be good. That's a prerequisite. Everything needs to be good. Peep: But relevancy is all about enrichment. Beause you could survey your people "Hey, are you interested in topic ABC? ", but you know, how many people fill out the survey? Getting the data is very difficult, especially if a list is tens of thousands of people. Kathleen: I also think a lot of times people don't realize how much they are interested in things that they don't mark off. Kathleen: Or they don't know what they don't know. So in fact data can be valuable. Peep: Yeah, exactly. That kind of solves this segmentation issue. If you can target people based on whether they're a manager or not, their job role, type of company they work in, and a bunch of other stuff like location and basically, like, your imagination can go wild with 50 data points from Clearbit. With Hull there's also a website tracking feature similar to Google Analytics, so we can see which URLs have visited us. So now I am able to send sales emails to people who've read blog posts on certain topics. So if you read three articles on copywriting, I'm going to guess you might be interested in copywriting. I'm going to send you a promotion about a course on copywriting. And so on. So the options here are endless. So in this day, in 2018, there is really no excuse anymore to do mass email blasts. Of course, there is an added complexity here, so you need to figure out and think logically about "What kind of segments make sense for targeting?" So we have a persona-based approach when it comes to job roles. So people like managers, who are head of digital, they have certain types of interests. And our personas for email marketing are largely based on their job role. Like what are their goals, aspirations, things like this. It's a mental model that helps us to think about personalization, it's not an accurate picture of the world. Kathleen: So you have this CDP in place and I've got so many questions I want to ask you about this. The first is: that's such an interesting approach, because when you describe your tech stack, you have Intercom, you have WordPress, you have Google Analytics, you have all these different pieces and you went in the direction of getting Hull, which is the CDP, to be the thing that tied them all together. Peep: Well it's a matter of a freedom of you can connect any, any piece of software to each other and you can do whatever you want. You're not limited by the feature set of your particular marketing automation software. Because, you know, whether you're using Marketo or whatever you do, there are always limitations to what you can do, so for me this is about the control and the ability to just hook anything up with each other. Kathleen: Yeah, it's certainly not an either or, because I guess you could use the CDP with Marketo or HubSpot. Peep: Oh yeah, for sure, because I mean if you start look into it, the CDP opens up new doors that you can't do with HubSpot or Marketo, right now. I recently attended this higher education marketing conference, so basically colleges who were trying to recruit students. So recruitment marketers or whatever you want to call them, and the universities, the people that I talked to, they were telling me awful stories about data being siloed. They have their student enrollment database and they have their website that has like application forms and then they have their web analytics and then email marketing is separate and all these pieces are not talking to each other. It's like "Oh my God, you guys are running a huge organization with a lot of complexity and these different pieces are not talking to each other." And when I asked why, it's different departments with different often conflicting goals and they have different budgets and different tech stacks and so again, you put a CDP in the middle of those, and the problem is instantly resolved. Everybody can still be in their own silo, but the data can still flow between departments very easily. Kathleen: That's great. When you talked about sending sales emails and the kind of decreasing returns you were seeing, you mentioned there were two things you did to address that. One was put in place the CDP, so that you could really do more contextual, personalized marketing. The other one was you wanted to grow your email list. So tell me a little bit about what you did to try and grow that email list beyond organically attracting people through great content. Peep: Right, so the personalization dramatically helped our open rates and click through rates, you know, like when sending a promo email to the overall list versus a personalized segment. We're personalizing to an extent of not just "Hey Judy," but "Hey Judy, you're a product manager, right? So for companies of your size that are doing ten million plus and using Google Tag Manager in your tech stack," because I can see it with Clearbit. I can personalize the whole thing about their email and they're like "oh my God, how?" Peep: Exactly. So open rates went up. People responded to the emails like "How did you do that?" You know? Kathleen: Did anybody respond saying "This is creepy, why do you know so much about me?" Peep: Actually no creepy comments. I received a lot of compliments from fellow marketers, like "Oh my God, how did you know?" Or sometimes Clearbit had their title wrong, like their previous title and they're just like "I'm a director now." You know? Kathleen: Right. I feel like it's a power you have to use with care because it can verge into the realm of creepy if you don't do it right. Peep: Sure, but I think we're also human beings living in 2018, we're just getting used to the creepy. Peep: Creepy is the new normal. So that's one thing. And growing the list... So there is this thing that is the bane of all marketers called tactic fatigue, right? Like popups when they became popular again in like 2012 or whatever, oh my god, what were the opt-in rates like 15 percent, 20 percent? It was crazy. And these popups that take over the full screen, what do they call them? Kathleen: Oh the overlays, yeah, they're terrible. Peep: Yeah, when those first came out, oh my God, how effective they were. It's ridiculous, I think like I had 35 percent opt-in rates and then of course everybody started using them and tactic fatigue kicks in and the effectiveness goes down. So now when you run a popup, and you get a higher opt-in rate than one percent, you're doing fine. You know, two percent is great. Kathleen: It's like direct mail response rates. Peep: Yeah. So growing lists the old way is hard. And of course we're not even going to talk about static opt-in boxes on your website, like in the sidebar or the bottom of the blog post. The performance is so horrible for those that popups are still better. It's still the best thing you can use on your own site. Just the effectiveness is down and you know. So for us, we are basically lbuilding anding pages for free email drip courses, so like "ten lessons about conversion optimization" or whatever it may be and then we're driving paid traffic onto those landing pages so we're building the landing pages with pixels, using Facebook and Google to try to retarget traffic. In order to do that, you need to know how much you should pay for an email. It's very easy to pay 20 bucks per email...it all depends on the keywords you're bidding on and you know, all that stuff, plus your conversion rate on your landing page. So it all plays a role and you need to optimize your keywords and your paid campaigns, you need to optimize your landing page and so let's say that you pay 20 bucks per email, which in some niches is cheap, like if you're in insurance, you know, it's ... You pay way more. Peep: So in order for that math to make sense, well, you just need to know your unit economics. Unit economics meaning I pay 20 bucks per email, and what is the conversion rate for all these people that I got through this landing page? How many of them will actually buy something within a certain timeframe? So you need to have proper tracking in place. And of course, depending on what you're selling, you often can't just come to the landing page and then buy something, you know, right away. Your product needs to be very simple and very cheap. For us, selling courses and predominantly we want to sell a subscription, so we're talking $300 to $500 per purchase. That's expensive and the product is complicated. So we need elaborate drip campaigns in between. So we drip them the course content, add value and eventually we'll ask for a sale or ask them to buy something. And then we need to be of course measuring the conversion rate and how much they pay and tie that back to our ad spends. If you do that, basically you need to make sure that you have all the data available. Without that, you might easily just spend all that money trying to grow your list and end up with nothing. Kathleen: And what kind of audience targeting are you doing for those ads? You mentioned you're doing some retargeting, so obviously people who have been to your site or looked at certain things. Kathleen: And you're doing some keyword targeting. Are you doing any other demographic targeting or lookalike audiences or anything like that? Peep: We do lookalike audiences. What we also do is we buy email lists. And not to email them, because it doesn't work, it's spam. So we buy email lists of people that we're trying to target, but we use those for lookalike audiences. So we run ads. So like for instance, we bought a list for growth people, people whose job title is growth manager or growth hacker, bla bla bla. And then we have their emails and a bunch of other data points and we advertise to them and try to get them to opt-in to our list. You can of course build those lists yourself. Especially if you have a sales team, you have BDRs going through Linkedin, maybe using Linkedin Sales Navigator or Datanyze, one of those prospecting tools, and you can build your own lists. You can do B2B sales to them, that's fine, but you can also just mine emails and just use them for your list, because retargeting and lookalike audiences and display is so much cheaper than doing keyword bidding. Kathleen: Yeah, that's such a great idea, I love the "buy a list and then use it to retarget." One thing I think is interesting about inbound marketing is people can get really dogmatic about it and say like "Buying lists is not inbound-y ", but it's not about buying a list, it's how you are going to use the list you buy and that is a great way to use a list that is inbound-y. Peep: Right, because even Facebook, you know, when it comes to targeting your ads, there's one thing that is missing. You can't target people who are in a group, you know, because that would be amazing, because that's exactly how you could really target people based on their interests. And you can't target people based on their job roles, you know? Kathleen: But you can do it on Linkedin. It's just more expensive in my experience. Peep: So it's not economically viable for most, maybe if you're P&G or I don't know who you have to be to make it work. You know, for a small business like ours, the unit economics just don't make sense, but buying a list, you can buy a list I think ... And sometimes you get these cold emails, you know, some of the list vendors pitching and then I used to always just delete or hit spam, but now I'm like "hmm, okay, tell me more," you know. So like recently I think I was offered a list of 180,000 marketing people for like I think $4,000. And I bought a list of like 2,000 growth people for like $200, something like that. And you can heavily negotiate. You know, whatever, they say "Ah this is $20,000." You say "I pay $2." And that's it. Kathleen: You put on your serious face when you said that. People can't see that when they're listening to the podcast, but I just got to see Peep's serious negotiation face, I think. Peep: There's a dogma against not buying lists and it's true, because you should not email those people, but it's all about just refining your targeting for ads. Kathleen: So I'm assuming that that has been an effective approach for you and that you're seeing more list growth come out of that. Peep: Yes, exactly, so to be honest this is a pretty new thing for us, we've been only doing it for a couple of months now, this list thing, but so far, it's been I would say our emails per day, which is a key metric for us, emails per day has significantly gone up. Kathleen: Great. One thing I'm curious about, because we have a fairly large email list and we're looking to grow it and the thing that keeps me up at night is how do we get our heads around the experience that an individual person in our database is having with regards to the emails that we're sending them. They can be subscribed to the blog, they can be converting on different offers in our resource center, they can be registered for a webinar. You know, they might be getting a sales or promotional email and obviously with the right systems in place you can certainly go in and look at that cadence, but from an organizing standpoint, like when you're running your marketing, how do you control that and ensure that your audience isn't feeling overwhelmed? Peep: Yeah, it's a very valid point. So some tools, like Intercom does this, it will show you a list of people who are getting too much email. And then you can save those people as a segment and exclude them from your mailings. So in your email marketing tool, you need to have a way to craft the segment of people that have received five emails in whatever time period and just exclude them from the regular mailings. I think the tools are still not good enough and I think in a couple of years maybe we'll have more intelligent email marketing systems that this can happen automatically and there will be dynamically changing segments and stuff. I mean, segments can change dynamically right now, but this over emailing aspect ... Yeah. Kathleen: It's a big challenge, yeah. Peep: That's a problem to address for sure, email fatigue. Kathleen: The other thing I'm curious about kind of on the opposite end of that spectrum is ... Or maybe it's not even the opposite end, but gray mail. People who are disengaged with your content. Do you have any particular strategy either for excluding them or for trying to reengage them? Peep: Yeah, so I do the strict MOFO strategy where I email people who have not opened my emails for six months and say "Okay, if you're not going to open this email too, I'm just going to unsubscribe you in bulk." And I do it. So typically, the open rate for that email is sky high, everybody opens. Peep: The subject line is "I will unsubscribe you." Peep: And then people will say "Oh, no please don't." Some are also really offended, and I get emails like "Ah, this is the rudest email I've ever got." Kathleen: You can't please everyone, that's for sure. Peep: Yeah, so I'm like "Well you haven't opened my emails for six months and I'm paying for you to be on this list, because that's how email marketing softwares work." So I think the dead weight just needs to go, because you know, your list size is kind of a vanity metric. "Oh my list is 200,000 people." You know? Kathleen: Got it. Really interesting. Any other kind of actionable takeaways you would offer to somebody who's listening and wanting to get more mileage out of their email strategy. I mean, anything from like, things to know about subject lines or any of that. Peep: If you want to dramatically increase response rates to emails, so you know, people actually hitting reply and replying to you, or taking action like clicking on something, then try to limit your email to two sentences. People are busy, they won't really read a long email. But like ultra short emails, I mean, this is what I use in my personal emails. Like my question to somebody is the subject line and ... so for instance yesterday I emailed my friend Morgan Brown and my subject line to him was "Do you know anybody who could teach a course on SaaS retention?" And the email copy was "Need somebody to teach a course on it." So, you know? And then I get an instant one sentence reply back, you know, with a name and that's all. I could have gone on "Hey, how's it going, how are the kids, the family?" And bla bla bla. Peep: But this is how you get responses, especially if you're sending cold email. So ultra short emails really work well. Kathleen: That's really interesting, I'll have to test that out. I have a couple of ideas I wanna use that on. Well there are two questions I always ask every guest that comes on this podcast. I'm curious to hear what you have to say. So the first one is: company or individual, who do you think is doing inbound marketing really well right now? Peep: There are three start ups that come to mind. So one is this sales software Close.io I think these guys came out of nowhere, or so it seems, and now they're everywhere. They're founder now is like a celebrity speaker at every conference, because their blog is just good and it's everywhere. They're doing a great job at content promotion. Same goes for Drift, the messaging software. They have their podcast, which is becoming very, very popular. They have their blog stuff and like, overall, they push the agenda of like branding is the new growth hack. And so they think like their approach or thinking is of content marketing as branding. And they're doing a great job at it. Growing like wildfire. And Intercom, I think the Intercom blog is top notch. They have a wide range of topics like their engineering people talk about engineering and their HR or managers talk about how to run one on one interviews with developers and they release a lot of these books, you know, like their guide to growing a business and their guide to this and guide to that. So there's a significant content production machine happening. The blog is also visually stunning. So yeah, those three. Kathleen: Awesome, I love it. I'll have to check all of those out. The other question is how do you stay educated and on the cutting edge of what's happening in marketing? Obviously our whole conversation today, or a lot of it, has revolved around technology and how quickly that's changing, and I think that's one of the biggest challenges that I hear people say to me as marketers is just keeping up with everything. So, what are your sources for that? Peep: Yeah, you know, I used to read ferociously, I used to spend multiple hours a day reading, when I was starting my business. Now I have a team. The company has evolved to a new stage and I just don't have the time to read a bunch of stuff and look for great content. So for me, curation is everything. So I need to go to places where there are curated lists. There are very few blogs that I constantly read. Like the only one that comes to mind is co-elevate by Brian Balfour. He writes these growth essays, which are amazing, but this is like once a month that he writes. But otherwise I rely on Twitter, some people that I'm following, what are they tweeting, so that's kind of like validation, somebody has still done the curation for me. I used to look at Inbound.org, but I think the content there is just ... I think they're on their way out. My subjective opinion, it's just garbage. Or it's just very ... The audience there is just somebody who just doesn't know anything about anything. It's very low level, basic content. Growth Hackers, again mix and match, hit or miss, sorry. Yeah, so I don't google stuff, I just have other people curate it for me. Kathleen: It's interesting that you mention Twitter. I had this conversation with another guest, because I had taken a Twitter break for a while and this year I decided I was going to really get back into it and the big game changer for me was removing 80 percent of the people I was following who just were tweeting about stupid things that I wasn't interested in. And as soon as I did that, it was like this revelation of Twitter is now so interesting for me and so relevant. So you know, when you talk about curation, I do think a lot of people, a lot of people think that Twitter is useless and the advice I always give is you really have to look at who you're following, because it's all about that. Peep: Yeah, so I have organized it by topics. These are the UX people talking, the analytics people talking, the CRO people, etc. So like by topic I'm watching the feed, so that's how I filter it. Peep: Mm-hmm (affirmative). CXL Live 2018. So it's taking place March 28-30, and it is a three day conference about four topics: Growth, Digital Analytics, Customer Marketing, and Conversion Optimization. We have a killer line up, like top optimizers, growth people from like, Instagram, Shopify, and Dell, you name it. Look at the speakers, it's very impressive. So, you're going to get really, really good content, but even, I think, more important than content is what we do on the networking side. So this is the place where you can meet other great practitioners doing interesting things because the best learning happens, not by reading blog posts but by talking to other people, learning how they do stuff. So our event is unique because we book a resort that's on the outskirts of the city, like far from everything, and everybody stays at that resort. Everybody stays together for three days, parties last all night long. Kathleen: Oh boy, get your sleep now. Alright, I love it and if you want to register for the conference use the code "impact-sent-me" for $350 off your registration fee. Great. Well, thank you so much. This has been really interesting and I appreciate you sharing all this. This is the first deep dive we've taken into email on this podcast. So a lot of good takeaways that I think people are going to appreciate. Kathleen: It's been my pleasure. Well, thank you all for listening and if you found this useful, please give us a review on the platform of your choice and if you know somebody else who's doing really great inbound marketing work and getting awesome results, please tweet me at @WorkMommyWork and let me know. I'd love to interview them. That's it for this week. "Images vs. No Images: What Should We Do in Our Marketing Emails & Newsletters?"